Erica Bunker | DIY Style! The Art of Cultivating a Stylish Wardrobe: FALLing Into a New Season! It's officially fall, but it's still hot y'all! Like 90 degree highs hot. I'm always super excited about a new season and fall has always been my absolute favorite. 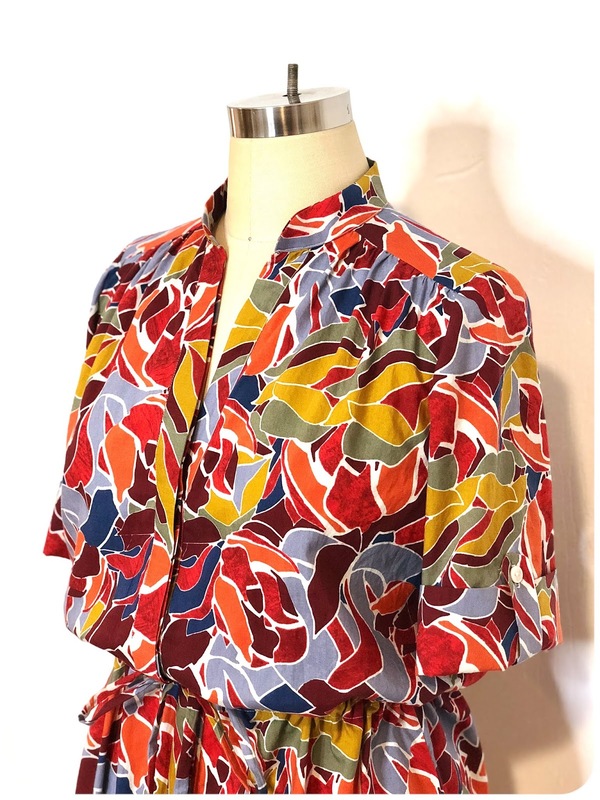 So when I ran across this gorgeous abstract cotton/tencel woven at Mood Fabrics, I knew I would use it for something for fall -- even though it's lightweight. The colors scream fall and when I bought it, I bought a significant amount because I was envisioning a dress. I'd had Simplicity 8084 in my pattern stash for years. I'd always planned to make it, but I just never got around to it. 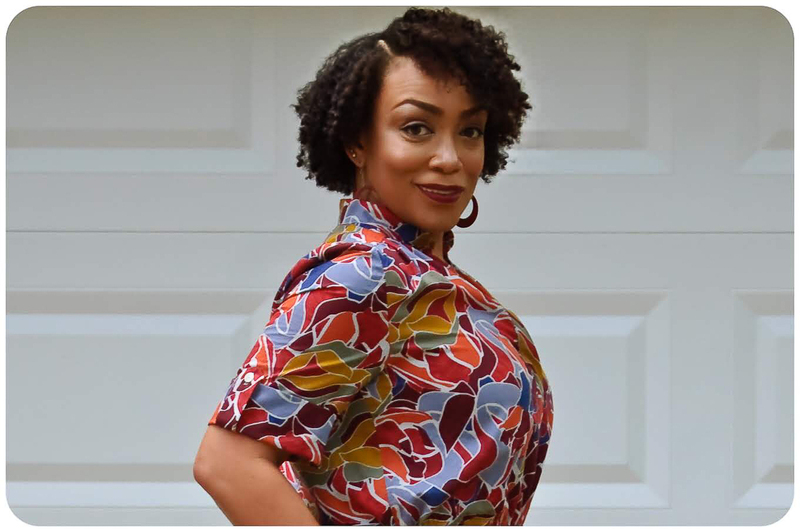 I love a shirt dress and since I had the perfect fabric with the perfect yardage, it was a go. I cut a straight 14 with no alterations. 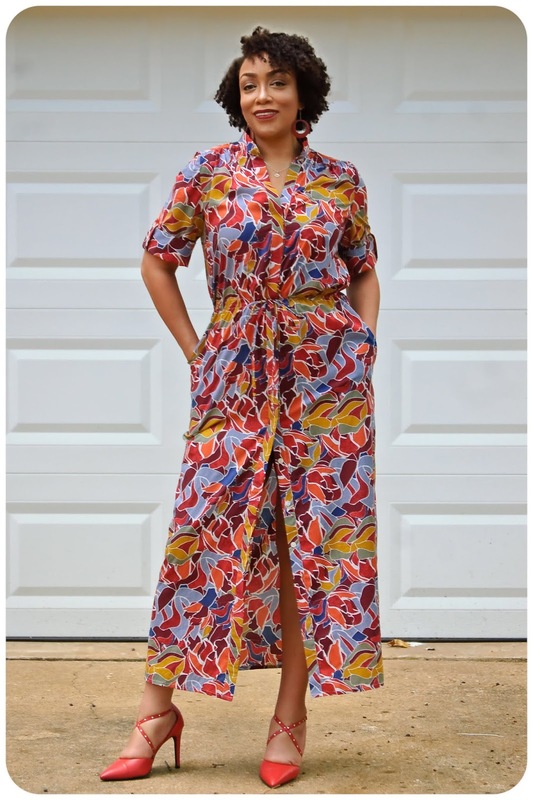 The dress is meant to be a little blouse over the drawstring waist, so it had enough ease that I didn't have to do a FBA. I love a simple design with good sewing details. This dress has a hidden button placket. And it's details like that, that make my sewing heart happy. I love the sleeve tabs. The sleeves are meant to be up all of the time. And that's fine by me. The one thing I didn't like is that the yoke was cut in one piece. I hate when some the patterns come like that. You NEVER see ready-to-wear yokes like that. I cut mine in two pieces so that the inside would be beautifully finished. 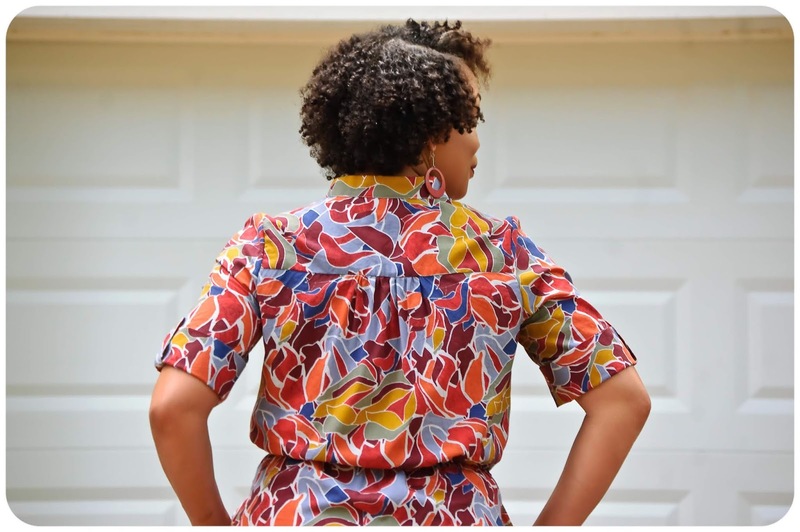 Here's my tutorial for How to Sew a Shirt Yoke. I didn't add any additional length. I'm pretty much over ground dragging maxis. I like for mine to hit at the ankle. This way, I know this dress will work with heels or flats and most importantly, I'm not tripping over the hem. Absolutely stunning! 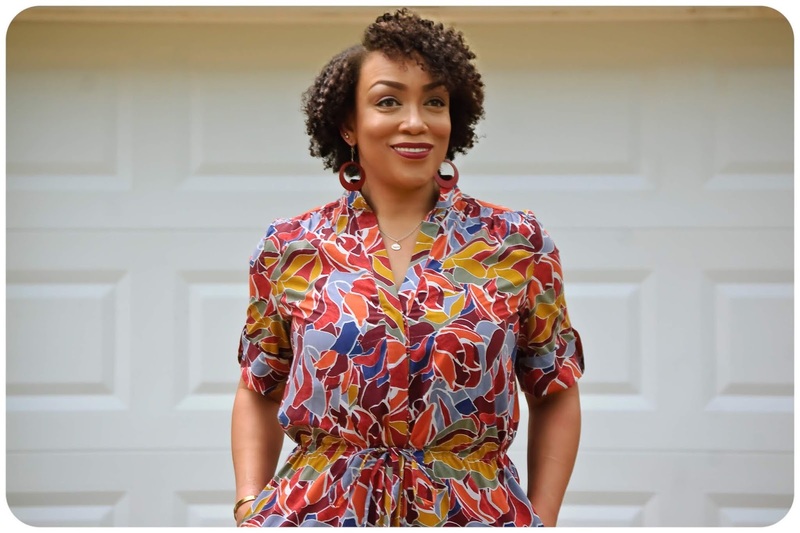 You are such an inspiration to all of sewists! Thanks, Erica! Just gorgeous. So elegant and vibrant. beautiful fall dress! 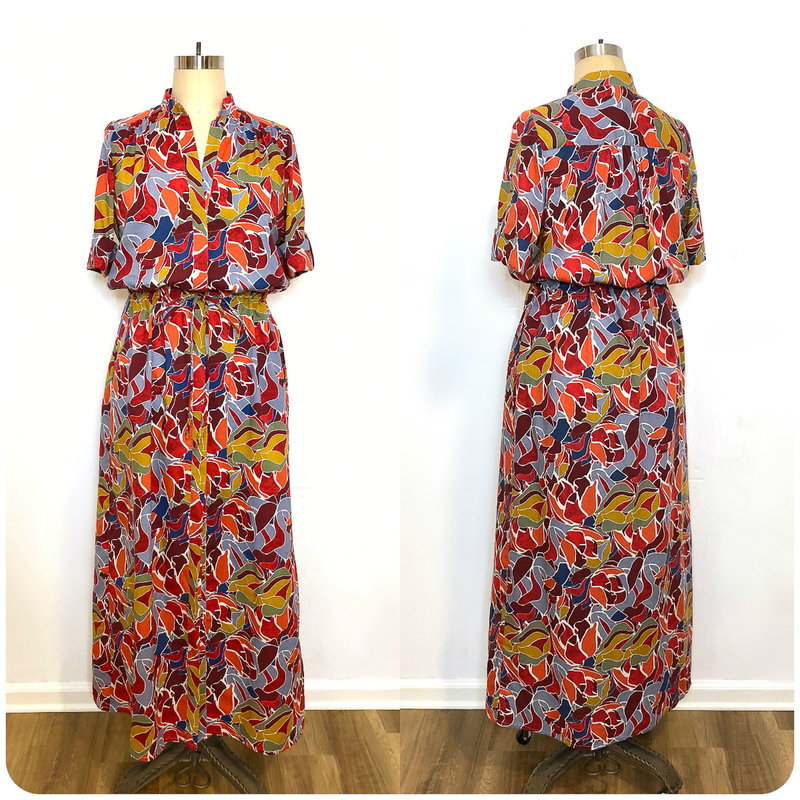 I live in Texas and know what you mean about wanting fall clothes but it is still summer temperatures - this dress hits the mark! It sure does. The fabric is the perfect weight. Thanks Nancy! Erica, you sew so beautifully in gorgeous colours. I really admire you! Gorgeous fabric and that print is perfect for it. You look stunning in those colors! 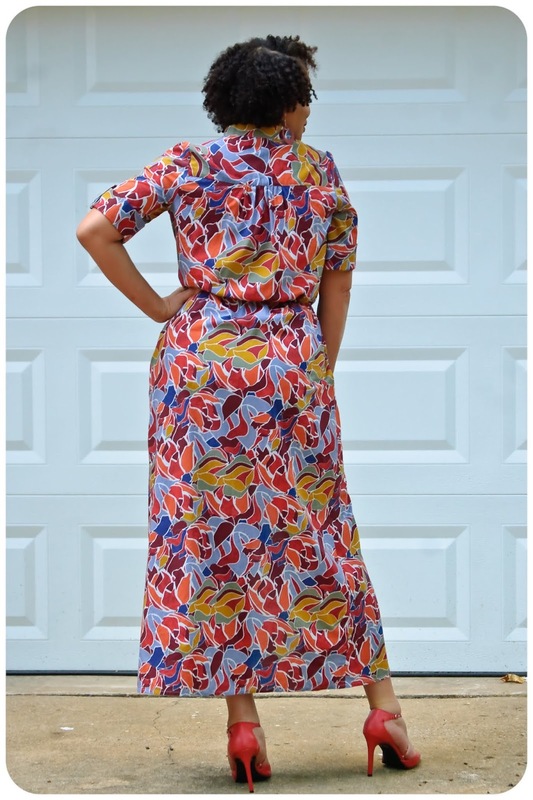 I love the collar on that dress and the fabric is scrumptious! As always, you look beautiful! I love everything about this dress! It looks stunning on you. Thank you for the video on sewing a yoke. What seam allowance do you use when you attach the yoke shoulder to the front? I sew it with a 5/8" and I trim it down to 3/8" or 1/4", especially on a white shirt where the SA will show through. Thanks Millie! OMG! I have this same fabric from Mood. It was so irresistible! I haven't sewn it up yet or even decided what to do with it because I'm so nervous that I'd make a bad choice and mess it up ... lol All I know for sure is that I want it to be something nice, but wearable so that I can enjoy wearing it often as opposed to so extra precious that I don't even use my make.